A gaggle of F-22A Raptors belonging to the 199th Fighter Squadron, which is part of the 154th Wing of the Hawaiian Air National Guard, deployed to the Middle East yesterday. This comes as tensions are hot between the U.S. and Russia over Syria and as the F-22 seems to be in demand around the globe. We couldn’t find a formal announcement of this deployment to the CENTCOM area of responsibility, just a video shot by the public affairs personnel with a short description below it appearing on YouTube. Deployments of F-22s to the Middle East are nothing new. The stealth fighters, at least about a half dozen of them, have had a seemingly constant presence there for the last half decade or so. Based out of Al Dhafra Air Base in the UAE, forward deployed Raptors were called into action during the opening airstrikes against ISIS and Al-Nusra targets in Syria last year. They are said to have had sporadic presence over the embattled country ever since. It is not clear if the 199th Fighter Squadron’s deployment has been long planned as a replacement for F-22s already in the region, or if it will be to bolster the force. It would make great sense that additional Raptors would have been ordered to the theater considering Russia’s rapid buildup of air power in Syria over the last month. This is especially valid considering that Russia is now actively using that air power over Syria and started doing so without any coordination with the U.S.-led anti-ISIS coalition already operating over the country. Apparently Russia’s warning as to their imminent use of air power in Syria came via a Russian General who walked into the U.S. Embassy in Iraq and told officials that the U.S. has one hour to clear the skies above Syria before Russian air operations begin. Bolstering the F-22 force in light of the Russia’s dramatic geopolitical choices over the last few weeks makes total sense. The aircraft can be present in Syrian airspace while not appearing on enemy radar, soaking up electromagnetic intelligence from Russian aircraft while also working as a sentry of sorts for allied fighter, attack and unmanned aircraft operating in the largely ISIS held eastern part of the country. If need be, the F-22 can also confront Russia fighter aircraft should they make an aggressive move towards coalition aircraft. As of now, Russia’s fighter aircraft contingent in Syria is tiny. Just four Su-30SM Flankers are known to be deployed to Russia’s master air base south of the Syrian port city of Latakia. Two dozen attack aircraft (Su-25s and Su-24s) are present there as well along with what seems to be close to a two dozen attack and transport helicopters (Mi-8/17s and Mi-35s). There are wide reports that Russia’s advanced Su-34 Fullback fighter-bombers are also deployed to the region as well, but so far these have not been substantiated with photographic evidence. As we mentioned in previous pieces, the Su-30s that are there as a minimum force that will most likely sit on quick-reaction alert and fly sporadic air cover missions for Russian attack aircraft. With this in mind, and considering that Russia has not deployed its long-range surface-to-air missile systems to Syria yet, the threat to allied aircraft, most of which can easily defend themselves, is not substantial. This could change in the future if more Russian counter-air capable assets arrive in Syria. As such, just the knowledge that F-22s are keeping a persistent watch over coalition air operations may make the Russians pause before proclaiming defacto air superiority over the country or harassing coalition aircraft going about their anti-ISIS business. One of the best things about the F-22 is the enemy finding it tough to know if it is even present at any given time, allowing for a small force to make a huge impact. Still, just a half dozen or so jets in the region based a thousand miles away from Syria is not a credible deterrent, even if the enemy cannot know if they are in the area or not. Adding the six or so jets from the Hawaii ANG is a whole different story. 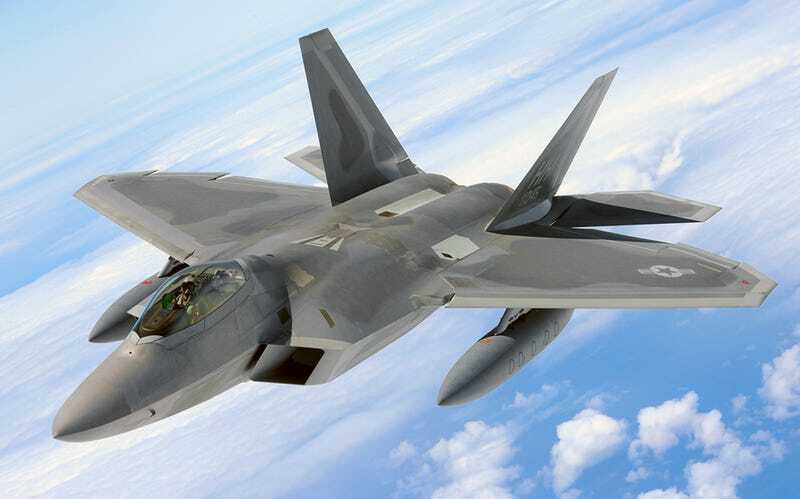 Additionally, a substantial F-22 force deployed to the CENTCOM region gives commanders options that they do not have with 4th generation fighter aircraft Options in such a potentially volatile military situation are incredibly valuable. Maybe it will take a F-22 pilot loitering at close to 60,000 feet above central Syria to suddenly turn off their “low-probability of intercept” radar mode and actively paint a Flanker with radar from over a hundred miles away, just to go electromagnetically silent again and disappear, to remind Russia who and what exactly they are dealing with. Who knows - that could be the Hawaii Air National Guard’s very mission. Note: We reached out the 154th Wing for comment and have yet to hear back from them. We will update the post accordingly if we do.